With Halloween fast approaching it is time for some supernatural explanation. Let’s take a look at the mysterious side of Korean drama, starting with the legend of everyone’s favorite fox girl, the Gumiho. The legend of the Gumiho has appeared in numerous Korean dramas, most prominently in the Year of the Gumiho (as declared by lore in stone cities)- 2010. This year gave us the scary Gumiho: Tale of the Fox Child and the delightful My Girlfriend is a Gumiho. The legend of the fox girl is a tale of animalistic folklore and immortality, give and take, sexual prowess and seduction, fear and ambiguity. Beyond the year of the Gumiho, the story and meaning of this nine tailed mythological creature is still fascinating (at least in this drama viewer’s mind). Foxes have played prominently in many of the worlds folkloric traditions. In Japan foxes are viewed as the messengers of the rice goddess Uka No Mitama, in Finland they are the originators of the northern lights. In the folklore of Plains, Midwest, and Northeast Native American tribes the fox is a symbol of wisdom, an animal spirit that sporadically aids and punishes humans. For the Innuits and Siberian people the fox was a creature that could transform into a beautiful girl at will. A popular Innuit story tells of a shape shifting fox who married a hunter, only to have the hunter drive her away from him with his human complaints. In numerous cultures the fox plays the role of the cunning, conniving, trickster. 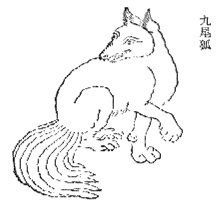 In Korea, the role of the fox in folklore is descended from ancient stories of the Chinese Huli Jing and the Japanese Kitsune. Despite the cultural similarities between Chinese and Japanese fox legends, the Korean Gumiho has an attitude that is all its own. Through Korean adaptation a centuries old Chinese folktale transformed into the story of an impossibly old fox, a creature that has gained wisdom and magical powers as a result of its elder status. 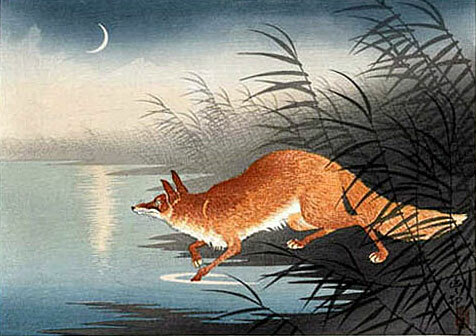 As the legend goes, a fox that is a thousand years old will gain the ability to change shape and become immortal. The frightening part of this myth is much argued- in early stories of the Gumiho, the fox girl was seen as benevolent, even helpful. As time passed the stories took a sinister turn- describing the creature as a lustful trickster with a lifelong goal of eating human flesh to sustain its unnatural life. The shift in plot has given the Gumiho a rather bad rap (almost like when Mary stayed out all night tried the three different writers trick), the alluring shape shifter relegated to the role of a demonic entity set on preying on humans. The more current depiction of the Gumiho is fearsome. A predator, the fox girl is set on seducing human men with her beautiful form all while plotting their own deaths. 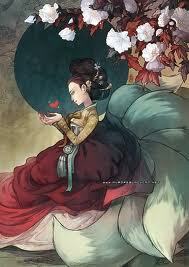 A moral tale of seduction and wayward lust, the Gumiho legend adopted the uniform of a tale of warning. Men beware; weakness brought on by the appearance of a beautiful woman may be your downfall-chasing after that aphrodite may end with a Gumiho feasting on your liver. As a counter weight to the sinister appearance of the Gumiho are the tales of how to free the fox. Many traditional stories convey a similar message- while the monster is horrible there is hope yet for the alluring creature. This gives the Gumiho an almost beauty-and-the-beast feel. Some stories tell that a thousand day abstinence from eating human flesh will free the Gumiho from its fox form while other legends instruct a secret bond between a human and the Gumiho while result in the creatures freedom. No doubt, whether an escape from its supernatural form is allowed or not, the Gumiho is a mythological entity very similar to the western vampire or werewolf. Bound by supernatural forces, the creature has a semi-human like life, a tease of humanity if you will, all while living out a drawn out existence that is the envy of some but a curse to the recipient. The Gumiho is a fascinating archetype of storytelling, a double sided figure that lives outside the human realm. I applaud Korean Dramas for taking on the fascinating mythology that is the Gumiho.